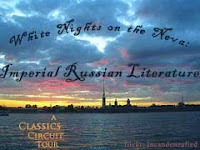 The Classics Circuit Imperial Russian Literature Tour. Even though I'm not a great reader of short stories I chose them because I couldn't see myself getting through anything heavier in a month I knew was going to be a busy one. There are twenty-one short stories in this volume with a variety of characters from the less privileged classes of Russian society and they provide a fascinating glimpse into their lives. I hadn't read Chekhov before but by the time I finished these stories I'd become a great admirer of his beautiful descriptive prose. 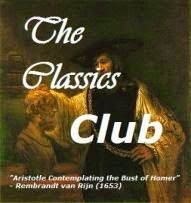 The title story, The Steppe is very different and at 82 pages much more to my liking. It is the story of a journey undertaken by a priest, Father Christopher, and a merchant, Ivan Kuzmichov, across the Steppe to sell some wool. Accompanying them is Ivan's nephew, 9-year-old Yegorushka, who is being taken to a school and it is through the eyes of the little boy that we experience the sights and sounds of the this great vast space. Along the way Yegorushka meets many fascinating people - he spends time apart from his uncle on a wagon train where he gets to know the different drivers and listens to their life stories. Eventually after enduring a terrible storm he is reunited with his uncle and reaches his destination. Yegorushka's adventures provide human interest but it pales into insignificance alongside the glorious narrative describing the steppe........the heat, the storm, the huge silence and the sounds of the wildlife........the imagery is superb. ".....in the insects twittering, in the sinister figures and ancient barrows, in the depths of the sky, in the moonlight, in the flight of the night bird, in everything you see and hear, you seem to glimpse the triumph of beauty, youth in the prime of strength, a lust for life. Your spirit responds to its magnificent, stern homeland and you long to fly above the steppe with the night bird. In this triumph of beauty, in this exuberance of happiness, you feel a tenseness and agonized regret, as if the steppe knew how lonely she is is, how her wealth and inspiration are lost to the world - vainly, unsung, unneeded, and through the joyous clamour you hear her anguished, hopeless cry for a bard, a poet of her own." Memorable reading and I think these stories would be ideal for anyone wary of Russian literature. 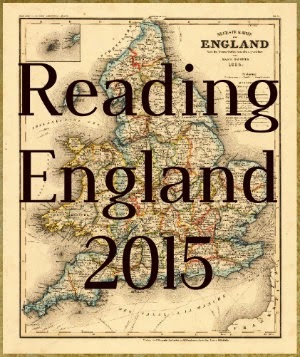 I haven't read this particular collection but I LOVED the volume of stories I read a few years ago. 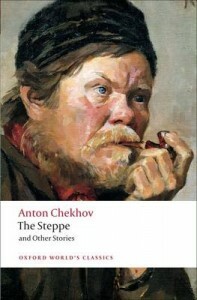 I should really revisit Chekhov. I loved his way with words and his view of the world. Thanks for this.